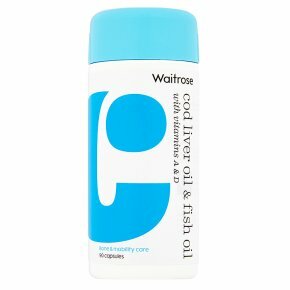 Provides the important Omega 3 fatty acids EPA (Eicosapentaenoic Acid) and DHA (Docosahexaenoic Acid). Vitamin D supports mobility by contributing to normal bone and muscle function. Do not exceed the suggested daily dose. Do not purchase if seal is broken. Food supplements should not be used as a substitute for a balanced diet or healthy lifestyle. Keep out of the sight and reach of children. Not suitable for children under 12 years of age. This product contains Vitamin A. Women who are pregnant or planning a pregnancy should consult their doctor before taking supplements.